We are so happy you made the decision to join a gym and know this is a great first step towards improving your health. At Colaw Fitness, we are here to serve and make your gym experience a positive one. Since 2006 we have been providing people a great fitness experience in a positive, uplifting atmosphere that glorifies God. Whether your goal is to start your fitness journey, stay in shape, lose weight or get in the best shape of your life, we are here to help you. Bring a Friend Free…..Every Day! Guests can TAN and MASSAGE for free too! Lose 10-30 lbs of Body Fat. Guaranteed! $5 a month when used 12 or more days in a month. $18 a month when used 11 or less days in a month. Monthly payment will be based on previous month use and will be billed on the 1st day of each month. All memberships have a commitment of 12 monthly payments. After 12 monthly payments, the membership will continue on a month-to-month basis. All payments will have applicable taxes. All Payments require electronic funds transfer from checking account, debit card, or credit card. All applicable governing tanning rules and restrictions apply. 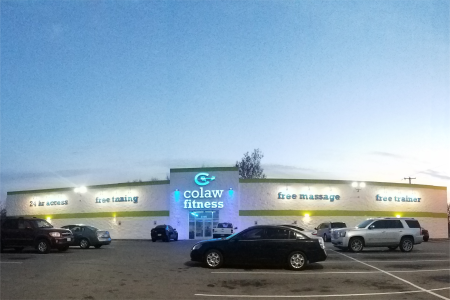 Our Joplin location opened its doors on January of 2016 and it is the second Colaw Fitness location to open. 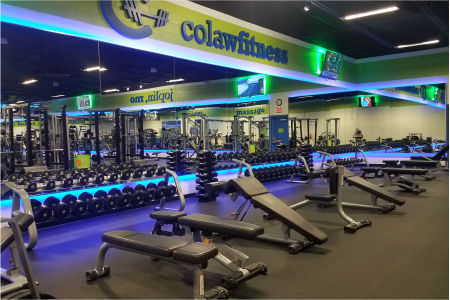 After 10 years of being open at our first location in Bartlesville, Oklahoma we took a leap of faith and built what is now Colaw Fitness in Joplin. We are conveniently located at 2706 E 7th Street, right off of Rangeline. We are open and staffed 24/7 making it convenient for members. Our memberships are all inclusive and give you access to EVERYTHING our club has to offer. Starting with great state-of-the-art fitness equipment to reach your goals and going all the way to private restrooms and showers (that’s right, NO AWKWARD LOCKER ROOMS HERE). 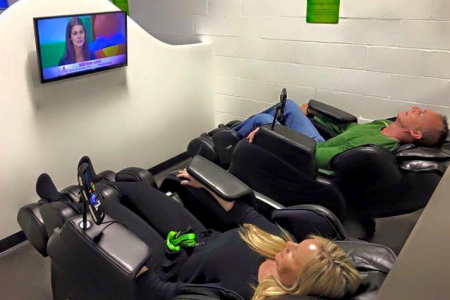 Did we mention that at Colaw Fitness you can always bring a friend free? That’s right, we offer free friend benefits with all of our memberships, so bring a buddy and start getting in the best shape of your life. 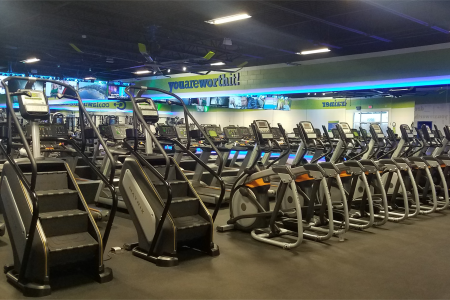 Our gym offers tons of cardio equipment to help you burn calories. There are also plenty of free weights and weight lifting equipment to help you tone your body. We offer free trainer instruction to help you learn how to properly use our equipment, avoid injuries, and get the best results. Because a good nutrition plan and exercise go hand in hand, we also offer nutrition instruction completely for free. Our CF-30 program is a 30-day diet and workout plan that guarantees you will see great results in 30 days. On this plan we will help you understand how foods affect your body and turn you into a fat burning machine. 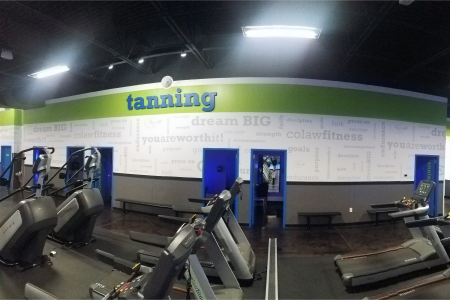 Colaw Fitness in Joplin offers unlimited use of tanning units for free with your membership. 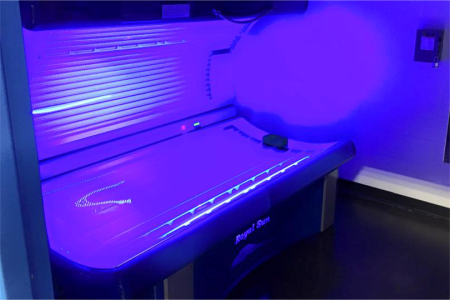 We provide both lay-down and stand-up units to meet your tanning needs. Unlike any other place, our tanning area is also available for your free guest. So, join us and get your tan on! Enjoy unlimited use of our massage area – if you are tired after your workout session, or simply after work, you can relax in our designated massage area. 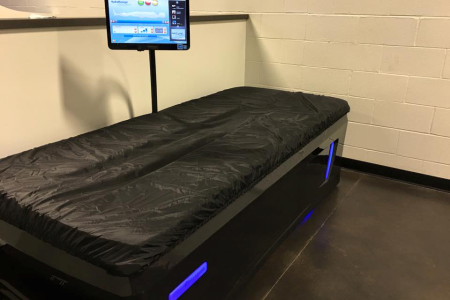 Our HydroMassage beds will ensure you have a very relaxing experience using water to apply pressure to your body. Visit us on the first Monday of the month for our Member Appreciation Night. This is a party with giveaways for anybody that decides to join our gym on that night. Did we mention we offer free pizza? Yes, free pizza is available from 4pm to 8pm so enjoy a cheat meal on us! At Colaw Fitness we are committed to giving back and that is why we donate $1 of every membership sold to Water4Lilfe Mozambique. This organization is dedicated to build water wells in Mozambique, Africa in villages that don’t have access to clean drinking water. Every water well built provides clean, safe, drinking water to approximately 1,500 people. Water wells change the way of life for these communities so they no longer have to walk for miles every day to get clean water. As of 2018, Water4Life Mozambique has built over 100 water wells in Mozambique. Our gym is the city’s highest and most reviewed fitness center in Joplin. Our members constantly praise the friendliness of our staff, the cleanliness of our equipment, and the maintenance of our equipment. This has given way to our internal motto of “Keep It Clean, Keep It Fix, and Love on People”. We take pride in offering super clean facilities with a super friendly staff. All the equipment in our gyms get cleaned daily ensuring a pleasant experience to our members. 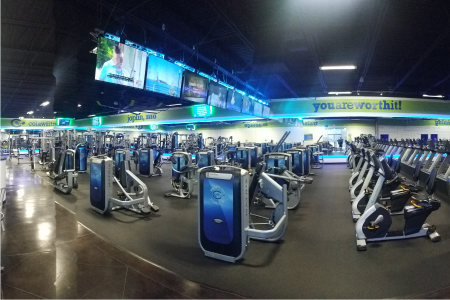 The Joplin gym facility offers an open layout with open spaces, so you have plenty of room to move and use the equipment. 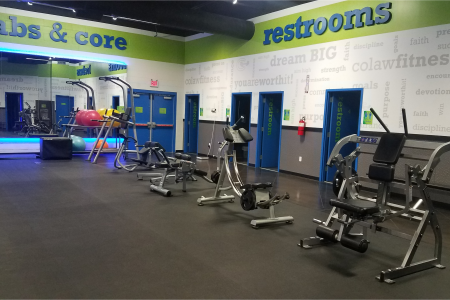 All of our different areas (abs and core, lockers, tanning area, massage area, free weights, restrooms) are well marked so you never feel lost in our gym. Our goal is to provide an environment in which everybody feels welcome, from first time gym users to more experienced ones. Because of this we have implemented a “No Gym Jerks” policy which makes sure we always have a friendly atmosphere. So, if this is your first time in the gym be assured that our staff and members are here to be friendly and encourage you. We are passionate about using our business as a ministry because we believe that God gives everybody a unique platform to impact others. We feel this is our calling and our goal is to make Jesus famous in the fitness industry. This goes in line with our core values which are devotion to God, discipline in living, denial of self, dream great dreams for God’s glory, determination to stay the course. 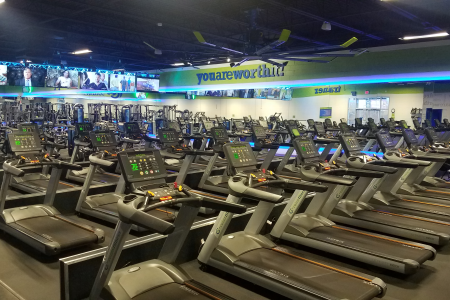 We are the best value for fitness in our industry by providing clean, all-inclusive fitness centers for as low as $5 a month. Our memberships encourage our members to exercise by rewarding them with lower prices. In consequence, our members will achieve better results faster. Give us a call today at 417-437-9345 and learn more about everything Colaw Fitness has to offer. Join now for as low as $1 down and $5 a month to enjoy everything that we have to offer. 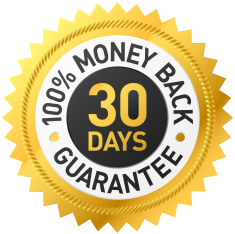 Our memberships are backed with a 30-day money back guarantee. If during the first 30 days of your membership you realize we are not the right fit for you, we will give your money back after the membership is cancelled.